All of us at The Garden Detroit are very grateful to have a newly built root cellar and hoop house. When the vacant lot next to our house was available to purchase last Fall, through Detroit's side-lot program, we purchased it and immediately made plans to have a hoop house installed. The cost of the hoop house was included in the grant we received from the Kresge Foundation to launch a flower business in our neighborhood. But, before the hoop house could be built, we had to build the root cellar first, because the hoop house was going to be constructed over the root cellar. Tee Dee Enterprises, a construction company who was refurbishing houses on the same block of our flower farm, came to the rescue and excavated the hole. When they heard Tom was planning to build the root cellar by himself with the help of friends, they convinced him that it was way beyond his capability. So, they wound up building the entire 30' long x 15' wide x 8' deep root cellar and did a fantastic job! Mega-Precast Company, a company in Roseville whose owner is interested in Detroit's revitalization, graciously donated the three custom-made 6" thick 7-ton-each cement slabs that form the roof of the hoop house. Another miracle occurred when an old friend of Tom, Ron Omilian, who is an AIA Architect, took an interest in the project and drafted exquisite specifications that intrigued and impressed Detroit's building permit department. This was the first permit they had ever issued for the construction of a root cellar. This fall we hope to raise enough funds to complete the root cellar by installing electicity, a manual dumb-waiter and 120' of heavy duty metal shelving. We contracted Nifty Hoops, Inc. to build our 30' x 72' hoop house. 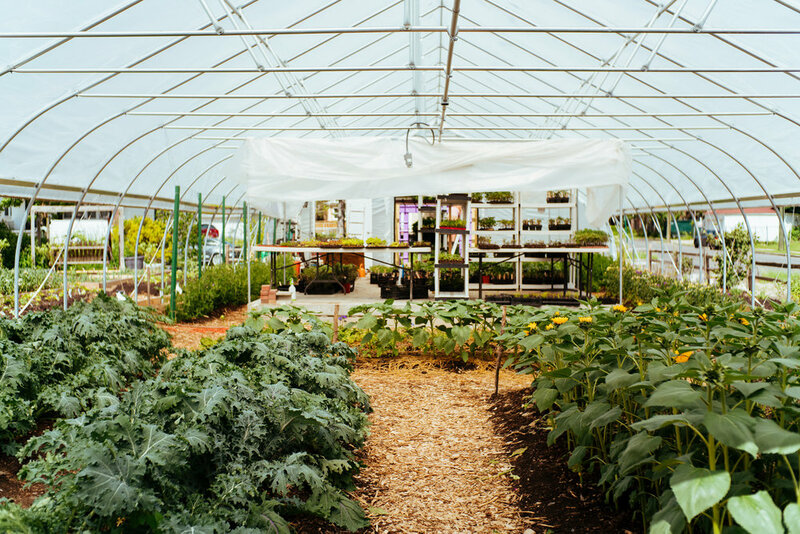 With a sterling reputation for building high-quality affordable hoop houses, their motto is "Farm More Seasons, Grow More Food." Jeff McCabe, the owner, waited patiently for several months until we finally had the three pre-cast cement ceiling panels lowered onto the root cellar, so that they could safely erect the hoop house over it. Fortunately we had a window of warm enough weather in December for Jeff and his crew to set the posts and construct the rest of the hoop house when weather permitted over the span of two weeks. We wanted to have it finished so that starting in February, we could begin planting and germinating seeds inside the hoop house. We're delighted that the construction of both projects worked out better than we had ever expected, thanks to God's grace. Here we are having a delivery of cement to make the footings. The hole was 40' long, 20' wide and 9' deep. You can not see it here, but we have a 10" deep 10' x 4' cavity in the floor that holds pea gravel and water. This inner reservoir of water is what creates the high 80-90 percent humility we need to over winter dahlia and gladiola tubers. The root cellarBeing embedded this deep in the ground ensures that the inner temperature of the root cellar will not exceed 50 degrees, perfect for dahlias. Here you see the early stage of the hoop house construction, where the base boards are being attached to the poles driven into the ground to secure the hoop house. The shaft on the right is built to accommodate a manual dumb-waiter that will extend from the top of the root cellar to the top of the hoop house. It will be used to lower and raise boxes of dahlia tubers. There will also be a three tier staircase built around the dumb-waiter staff. Then there is an inner door where that leads to the main chamber where the boxes of tubers will be stored on shelves that line the walls. Here you see the ribs of the hoop house, which are 4" apart from one another. The roof of the root cellar we are going to use as the floor of our inner germination room , our hoop house within a hoop house. This picture shows the three ceiling panels that were placed on top of the root cellar roof. The three holes will be vents for warm air to escape and there are three tubes on the right that will be part of a cool air intake system that will enter the bottom of the root cellar and gently force warm air out, thus creating circulation. Here we see the hoop house completed. We've asked our neighbors to be patient, because by May be will make this corner very attractive, with gorgeous gardens, a cedar split-rail fence, new sidewalk and fruit trees.